This month’s theme is literary! Picking my favorite book character was easy. It was always going to be either Eponine from Les Miserables, or Haydee from the Count of Monte Cristo. Haydee would have been more exotic, but Eponine won out. It was easier to draw gutter 19th century French clothes than try to do justice in short order to 19th century Turkish royalty. I would have had to Google it to death. I hope you enjoy these outfits. You have Eponine’s day wear with a long belted wrap, and her outfit for sneaking through the barricade. She disguises herself as a boy to get a message to Cosette (who didn’t deserve it). And her actions have tragic consequences. This collaborative doll is posted at the end of each month throughout 2017. There’s a new theme each month! 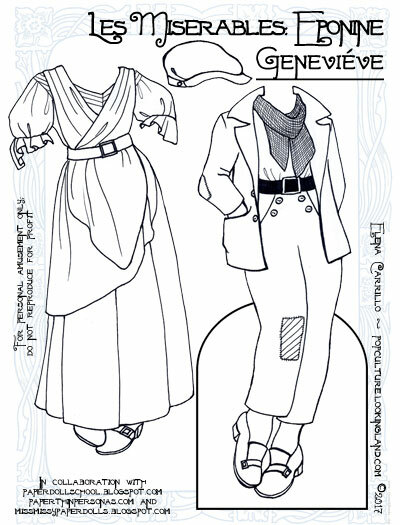 To find all related posts on this blog, just click the “Geneviéve” tag.